How to grow your own salad. For many years, I’ve grown herbs and tomatoes. 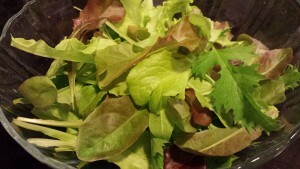 This year, lettuces, spring mix, arugula, and other greens went onto my “grow your own” list. 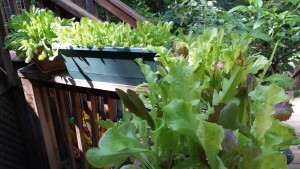 Lettuces will grow pretty much anywhere as long as they have some sunlight or a grow light. You can grow your own salad even in your own apartment! Because I’m limited on sun and growing space due to our local deer population, I have quite the extensive potted kitchen garden on my back decks. Herbs tend to do well in pots. I wasn’t too sure about greens though. I bought some potting soil and a number of seed packets. Spicy spring mix, green lettuce mix, zesty lettuce mix, heirloom arugula, and regular green leaf lettuce seeds all went into pots. I wasn’t sure what would happen. My decks get about 3 hours of direct sunlight and probably another 4 hours of dappled sunlight. With a few days of heavy rain after planting, and then some sun, my seeds sprouted! I kept reading that a garden area needs a lot of full sun to grow lettuces. 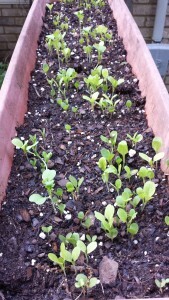 I was amazed at the bounty of baby greens that sprouted! I planted maybe 1/4 of each packet in a pot. 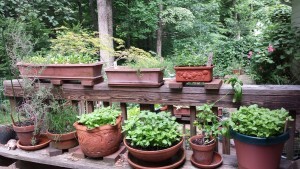 Growing greens in pots requires frequent harvests (yes, they will grow back!) and discourages the slugs from ruining the crops. 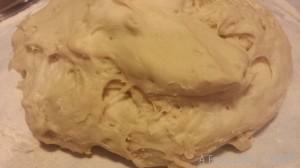 Just smear a bit of Vaseline or other petroleum jelly in a constant circle around your pots so the slugs can’t crawl up. That won’t stop the birds from dropping them into the pots accidentally, so do check your greens for pests often. This morning, I found tiny green caterpillars chewing on the greens in one of my pots. My salad bounty has been plenty for the few weeks that the greens have grown to harvest size. You can clip them with garden or kitchen scissors so that they will grow back. Snip whole leaves and don’t pull out the roots and you will have a renewing garden. 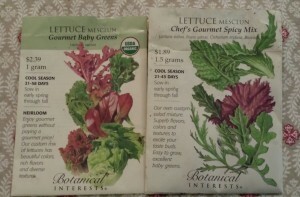 Be sure to harvest your baby lettuces before they “bolt” or start to flower. 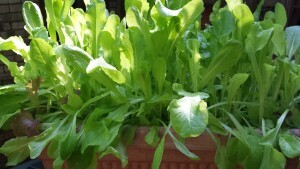 It’s best to grow lettuce in cooler weather such as Spring and Fall depending on whether your location has hot summers. 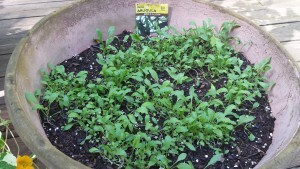 Grow several different types of baby greens. In addition, I’m growing a number of herbs. I like to snip herbs such as basil and chives to use in my fresh salads. I’m growing several types of basil, sage, mint, chives, thyme, Italian parsley, oregano and rosemary in my potted kitchen garden. My cilantro bolted pretty quickly this year, so I planted some seeds. I haven’t had great luck growing cilantro or tarragon. My neighbor grows tarragon in her very sunny and much larger farm garden. I’m lucky to have access to it whenever I need some tarragon. Most herbs love hot weather as do tomatoes. 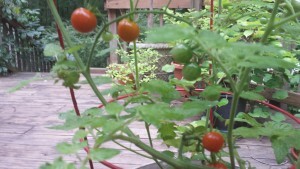 I also grow heirloom tomatoes and cherry tomatoes in pots on my deck. Because I don’t get a lot of direct sunlight, my tomatoes tend to be late producers. One year, I had so many unripe green tomatoes in mid-October — just as the frost was about to hit — that I roasted all of them. Then, I made the roasted green tomatoes into a wonderful green tomato sauce for the freezer! You should definitely make some Roasted Tomatoes and also use them in my Rustic Roasted Tomato Sauce! 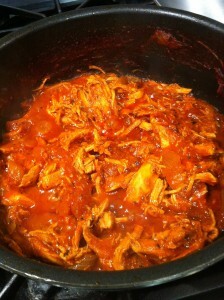 Use my roasted tomato sauce on pasta or pizza or as a dip for breadsticks! 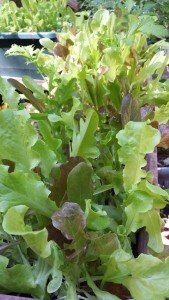 So how do YOU start to grow your own salad? First, get some growing containers that have drain holes in the bottom. Fill the containers with potting soil. Then, dampen the potting soil with water and then sprinkle some greens seeds or herb seeds on the soil. Cover the seeds with just a bit more soil depending on the directions on the package. Some seeds need to be covered, some don’t. Then lightly water the seeds using a light mist or spray from your garden hose or a spray water bottle. Set your containers in a sunny area and wait. Keep the seeds a bit moist until they sprout. Then in about 2 – 3 weeks, you’ll have salad ingredients of your own! 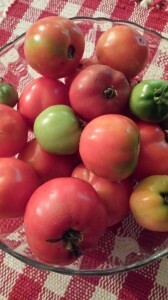 For the tomatoes: I prefer to purchase baby tomato plants from local growers. You can grow yours from seed if you like. Tomatoes are a bit more testy for me to grow. I usually get a tomato cage for each plant that I grow in a large pot. 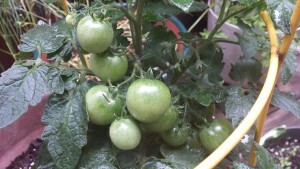 The smaller bushy patio tomato plants are better for me than the vine-y kind. Just get a large pot, fill it with good potting soil, and plant a tomato plant in each pot. Don’t overwater the tomato plants or they may be more susceptible to diseases. I use crushed eggshells around the tomatoes. Not sure why the eggshells work, but they make for a tasty tomato. Try some of my tasty salad dressings on your own homegrown salads. Baby greens are very delicate so be careful when tossing them. 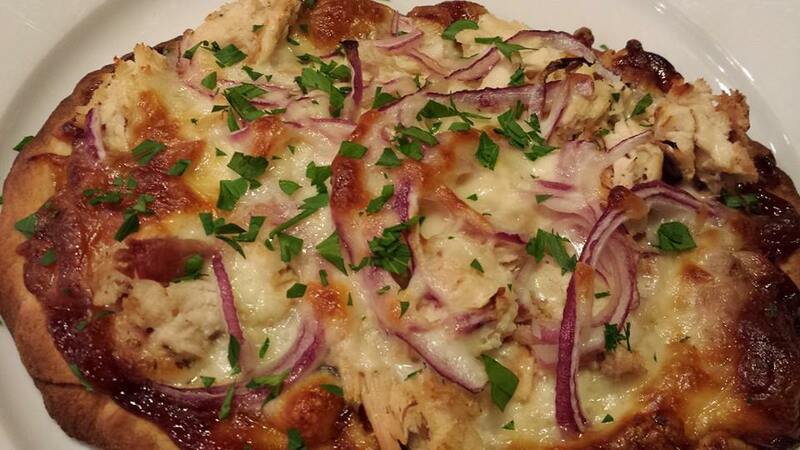 Sometimes it’s better to just drizzle on the dressing. 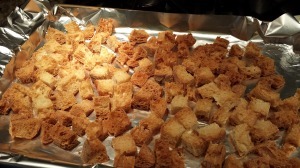 Also, check out my posting on How to Make Croutons for Soups and Salads. 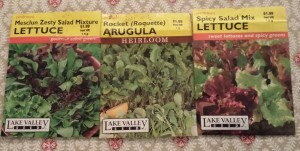 Get an assortment of seeds to grow in your garden! If you don’t have a lot of sunlight in your area, or if you don’t have a balcony in your apartment, you can also use a grow light and grow salad greens inside! Check out this great option from Amazon.com .